Every now and then the weather can become a real nuisance. The wind, especially, can bring about challenges that we don’t expect. Unless you’re out on the open sea, sailing and enjoying the fresh air, the wind isn’t something one enjoys walking around in. Windy days can be a nuisance for dogs and owners alike. Whether you’re out for a walk or just trying to get in the door, the wind sometimes puts dirt, dust, and debris in your hair and eyes, all of which is very irritating. What happens when your dog has to go out on a windy day? Some dogs seem to like the feeling of the wind on their face, which may be why they occasionally stick their head out the window and let their ears flop in the wind. But, the more likely truth is that the wind actually carries all sorts of scents and smells along with it, simply making your dog curious. And while most dogs aren’t going to be blown away, extreme winds can be uncomfortable especially when they have to potty. Wind has a natural knack for blowing things around and putting them where they don’t belong. What happens when your dog poops or pees in the wind and gets it all over themselves? A mess is what happens. While on an average day gravity seems to keep your dog’s fur relatively clean, some heavy wind bursts can end up soiling their fine coat. Helping your dog feel comfortable in their potty area is going to be your ultimate goal. You want them to stay clean and keep the debris out of their fur and eyes as well. Finding a choice location will often depend on where the wind is coming from, although areas that have three walls, such as a lane between the side of a building and fence, prove to be very wind-resistant. In most cases, your dog will likely enjoy a brushing when they get back inside (static is going to be a surprise to both you and the dog). Check their fur for any potty debris that might have gotten tangled in the wind. Also check their eyes and remove any dry tears and accumulated dirt to avoid irritation. What if it’s raining at the same time? This can make things a little trickier for everyone involved. When the rain starts coming in, it can be difficult to stay dry let alone find a good spot to take care of business. If this becomes a consistent issue, you may want to consider an indoor potty solution so both you and the dog aren’t navigating extreme, uncomfortable weather. 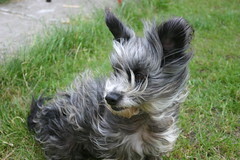 A windy day may not seem like an extreme weather condition, but it can definitely be a nuisance for you and the dog. Do your best to keep the dog out of the wind and find a good spot for them to use when it comes time to potty. Clear away any dirt and irritants from their eyes and fur, and they will be comfortable and happy for a long time.